Now my 33rd birthday is coming up in just a few days and I’m not sure why but recently I’ve heard on the radio, tv, podcasts etc people talking about the transition from your 20’s to your 30’s. Some have referred to it as a ‘quarter life crisis’, other’s just a quest for stability, you get the idea. I think it happens for different people at different ages and I don’t know if it is always a crisis but for 99% of people they transition from a dreamer at 20 to a realist at 30. I’ve talked about my own such struggle many times on this blog, the search for a ‘dream job’ and how I settled for an accounting job that gave me a living. Yes, I totally settled but that hasn’t been a completely bad thing. I get to work from home, can afford a house, and face the daily challenge of trying to master something that I maybe am not the most naturally suited for. I didn’t intend this to be a sad post but I’ve thought about her statement many times. That the hard moments in life and aren’t softened by the years merely given a happy ending of triumph. It’s like in my open water swims- the memory of the waves and salt are still biting but the knowledge that I finished reassures and exhilarates. Anyway, I guess if I have a quarter life crisis it is perhaps the worry that with the purchase of my home the most exciting event of my life is behind me. I say that not to engender pity but as a real genuine emotion I had to work through. What if I don’t marry and spend the rest of my life as a single accounting clerk in Draper, writing her blog and swimming? What if? Well, than that’s ok and there certainly could be drastic change. My patriarchal blessing sure promises some but it could all be the same too. We will see! The other thing is that my desires are changing. I was thinking about that this December and even before I got sick I was soooo grateful I was not traveling for the holidays. Even visiting my family I am not as happy as when I am in my own home- even sick. I used to think that traveling was the greatest and now it doesn’t appeal much for me. The trip to Disney in 2013 made me realize that unless I can go to a beach, pool or lake travel really doesn’t have much draw anymore. It’s so exhausting, my feet and muscles hurt so badly and unless there is a beach it just doesn’t sound fun. I’ll do my best and be open to whatever is in store for 2014. We’ll see! Can anyone relate to these thoughts about the transition between 20’s and 30s? Between leaving home at 17 until age 23, I was globetrotting. Between 23 and 33, I was a stay-at-home mom with 4 kids, while making several trans-oceanic and trans-continental moves. Between 30 and 50, I ran a home-based business and wrote a self-help manual for my clients, while doing one trans-oceanic and three trans-continental moves. Between 33 and 52, I was earning two college degrees, being a single mom, working outside the home part-time, homeschooling my kids, and fighting increasing disability. Between 52 and 58, disability took over completely, I earned a third college degree, made the final trans-oceanic and trans-continental trips of my life, wrote a 200,000-word novel, and began writing two other novels. You are probably right though about not being busy. I’ve been sick in bed for the last 2 weeks and had a lot of time to myself. Still hanging on. Seems like I will never get completely better. Eat your chicken soup, drink tomato juice, and when you’re not napping, plan for your next Great Adventure. Let me know via e-mail, if you’re not on your feet in a few more days. Thanks. I’ll do that! My goal is to save for a vacation house now that I have a regular house. Wow what an amazing life you’ve had. I’m jealous. I think most of us end up making some sacrifices with our dreams as we grow up. 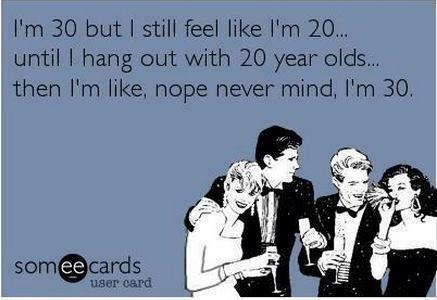 I think a lot of time that happens when you move from your early 20’s to your 30s. Like I said an idealist becomes a realist. In some ways that is a really good thing but I still wonder about my life. So, I don’t come from a privileged background, but I’ve never felt as if I was sacrificing anything. Perhaps it’s also because I knew some of my immigrant ancestors, too. They would never talk about life in the old country (which, when I began doing genealogy, I found out was nasty, cold, brutish and short), but I’m sure they must have had the epiphany, “There’s got to be something better than this,” and they had the gumption to act on their beliefs, even if life in the Land of Opportunity didn’t bring them fame and fortune. That is amazing. What a legacy! Thank you for the perspective. I’ve been thinking about what you’ve said and I suppose it all depends on your perspective, whether you chose to see change as a sacrifice or just a change. I still think most people have to lay some dreams to the side as they mature. I mean only one person can be president, only so many people go up in space, win gold medals, have hit records, whatever the youthful dream might be. Most of us pick up the pieces and move on but still look nostalgically from time to time at the early years. That’s all.